A professionally made portrait can show the true spirit of your animal much better than a quick snapshot can. I always take time to interpret your photographs artistically – why have a painting or drawing that’s an exact replica of your photograph? 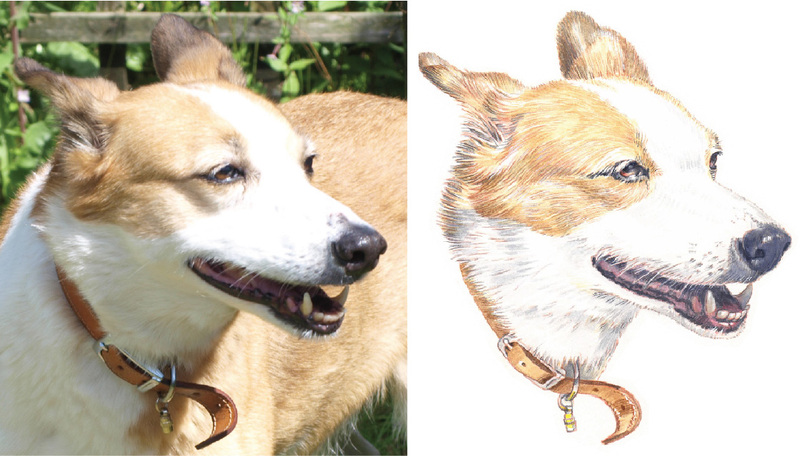 Only by careful study and combining references can I bring out the personality of your animal. This may involve adjusting a pose for the best composition, or painting some areas with higher contrast while muting others, to create a feeling of depth and three-dimensionality. Firstly, I set to work in the studio making a selection of the best photographs or studying the pose you prefer. It’s at this point I may wish to contact you for clarification of any detail or if I need more colour information. I may also suggest a different pose if I think it works better artistically giving you a better result. The photographs are scanned digitally to alter contrast and to help me see as much detail as possible. A basic line drawing is then made emphasising the areas I wish to define and this is transferred to the painting or drawing surface attached to the board or easel. For a painting I will start by using large round wash brushes – size 6 or larger – to block in areas of colour or shadow, usually choosing Saunders Waterford hot-pressed paper. 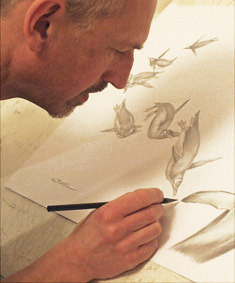 As it progresses, I refer less to the photographs and focus more on developing it artistically, using finer brushes – size 3 and smaller – for detail such as fur and whiskers. 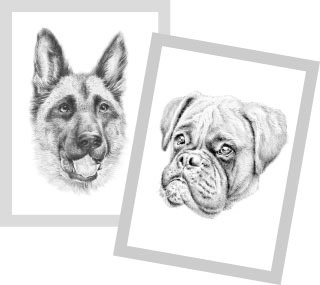 The graphite pencil drawings are made at a smaller size but they still have a high level of detail being produced on fine-textured Bristol board using a range of 0.5mm clutch pencils. Finally I refer back to the photographs one last time to make sure I’ve created a portrait both you and I will be pleased with. Only the highest quality artists paints, papers, drawing surfaces and acid-free mounts are used which ensure your portrait will last for many years to come.